I read Jon Krakauer's Into the Wild for an online book club. I haven't seen the movie, and didn't know much else about the story other than I knew a movie had been made about it. 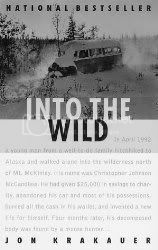 Into the Wild is Krakauer's account of Chris McCandless' decision to remove himself from society and go into the Alaskan wilderness, only to die of starvation a few months later. I thought Krakauer researched his book well enough, but there were a couple of things that annoyed me about it. I liked the comparisons he made with other adventurous souls who seemed to share McCandless' passions, but the 2 chapters that he devoted to his own mountain climbing adventure seemed a little self serving, and to be honest, I skimmed right over them. I wanted to read about McCandless, not Krakauer. The other bit that I thought could have been done better was the inclusion of pictures. It is mentioned several times in the book about the rolls of film that were found with McCandless' remains, but the only photo shown is the one of McCandless at the very front of the book. Of course, this could have had something to do with the family wanting privacy and all that, but a very cursory search on Google found several of them online. I think that the inclusion of some of these photos would have been a good idea. Maybe I'm wrong about that and maybe others would see it in bad taste, but I think the photos would have really driven home what he was going through. Realistically, I think it's going to be impossible to ever really know what was going through McCandless' head and quite a bit of the book ends up being speculation on Krakauer's part. Part of me wants to think that he was a seriously troubled young man, and the other part of me thinks he really just wanted to step away from his life for awhile. I've often thought that I'd like to step away and become someone else, if only for a little while, so I think I can relate to that idea, but to take it to the extremes that he did? I don't think that would ever happen. I think this was a great choice for a book for our book club, but I don't know that I'd be recommending it to anyone unless this is the type of book someone is looking for. At the same time, I'm glad that I did read it, and I wouldn't have read this otherwise, so thanks for choosing this one first off!